Home > Symptoms > What Are Histamines? Hay fever sufferers are probably familiar with the term 'histamines' having read it or heard it spoken by a medical professional when discussing hay fever. Many, however, may not understand exactly what kind of role histamines play in the body or why their presence is an important factor in the formulation of hay fever medications. The more you understand how your immune system functions and what role histamines have in your body, the better you can make informed and active decisions about your health when treating your hay fever symptoms. Your immune system functions to protect your body from an enormous range of invaders, including viruses and bacteria. For some people, however, their immune system essentially overreacts to a substance that is normally harmless to other people. The reasons for this reaction are still largely unknown but genetics are believed to be factor, so if your parents suffer from allergies, you will be more inclined to suffer from allergies as well. When your body is exposed to an allergen, your immune system launches an attack, releasing several chemicals from mast cells. One such chemical is called histamine, which is a major mediator in a hay fever response. In particular, histamine is a key player in an immediate allergy response. Histamines cause swelling of the nose, eyes and sinuses, leading to the characteristic and painful hay fever symptoms such as irritated eyes, a runny nose and itching around the face. The reason for the response is that your body views this foreign substance as an invader, rather than the harmless substance it is for most people. Unfortunately, there isn't much one can do in terms of simply 'curing' the allergic response, although some people do have success with immunotherapy. Most people will first work to reduce exposure to the offending substance and will also use medications to address chemical mediators such as histamine. 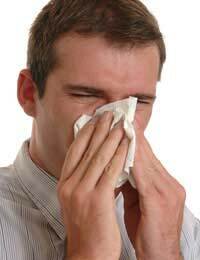 There is an enormous range of hay fever medications that can effectively treat your hay fever symptoms. Many of these medications work to modify the effect of various chemicals released by your immune system during an allergic reaction. Antihistamines work precisely as the name suggests - they control the effect of histamines in your body. They work to reduce, or even eliminate, the effects of histamine on the body, thereby relieving your watery eyes, congested nose and irritated throat. Histamine receptors themselves are widely distributed in the body. Antihistamines may work in tablet form to treat the effects of histamine throughout your body or they may be used directly on your nose, for example, where they will target histamine in nasal passages. It may be confusing to think that your immune system releases a substance, which then causes such painful symptoms like those experienced by hay fever sufferers. Your body's inflammatory reaction is, however, an important one when it is reacting to a true invader rather than an allergen. Focus on avoiding the allergen and consider using an antihistamine to combat the effects of histamines in your body. You can effectively treat the effects of histamine and successfully relieve your hay fever symptoms.